Myself, two visual designers and another UX designer created a visual prototype to start defining the digital experience for a renter's insurance application. With the other UX designer, I was responsible for rapidly creating/articulating user flows, sketching wireframes for the visual designers to reference, then stitching the visuals together into a prototype. 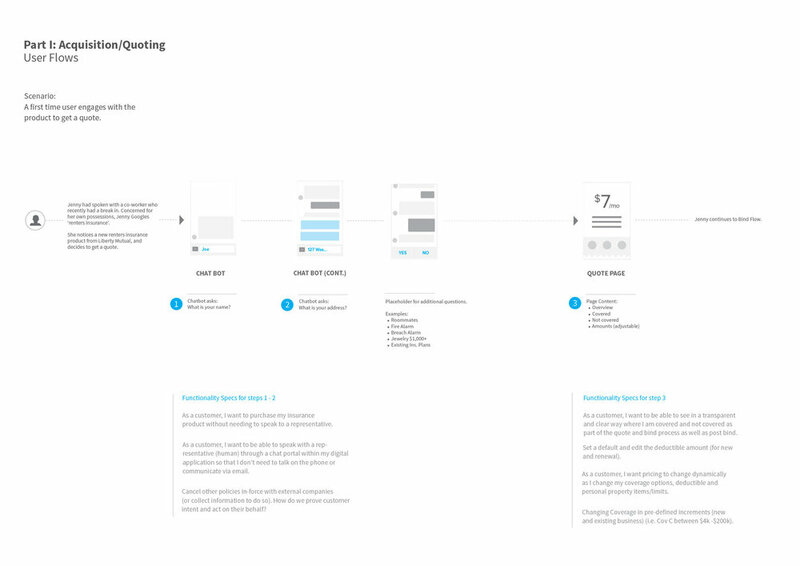 The prototype was created using UXpin. An example of a sketching session in preparation for discussion with the clients. The visual designers used these sketches to build their designs and layouts. We quickly assembled user flows to facilitate discussion with the clients. Below are a few examples of what those flows looked like. Sometimes we added additional tangental flows after reviewing with the client.